Mitch in the Police Station. 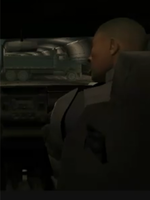 Mitch in GTA IV, during "Tunnel of Death". Mitch is a character in Grand Theft Auto IV. Mitch is a member of the Liberty City Police Department as of 2008. 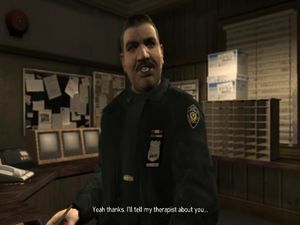 He only has one appearance during the mission Final Interview where he's seen speaking briefly with Francis McReary while he takes Niko Bellic to his office. There is also a second LCPD officer named Mitch. His only appearance is in the mission Tunnel of Death. He is however killed after exiting his police car in the hopes of moving the blockade. Niko Bellic and Patrick McReary set up in order to capture (and later kill) Aiden O'Malley. He is killed by either Niko or Packie depending on how the gunfight plays out. Mitch from the LCPD station is obviously not Mitch from the Tunnel of Death. This page was last modified on 26 October 2013, at 17:19.